The most terrifying lesson of Anthony Baxter’s 2011 documentary You’ve Been Trumped wasn’t the warning about the behaviour of the bully-boy billionaire business man Donald Trump, but rather the terrifying acquiescence of state players, police and politicians in facilitating his behaviour and crushing any opposition no matter how tiny. Alec Salmond, the SNP, the Scottish press and local constabulary all became willing lackeys, egged on by transparently exaggerated boasts of investment in the region and massive employment. In the process, all turned a wilfully blind eye to tactics of intimidation as well as irreversible environmental damage. Five years on and Baxter is back with a sequel that is a little too intent on – justifiably – telling us ‘I told you so’. 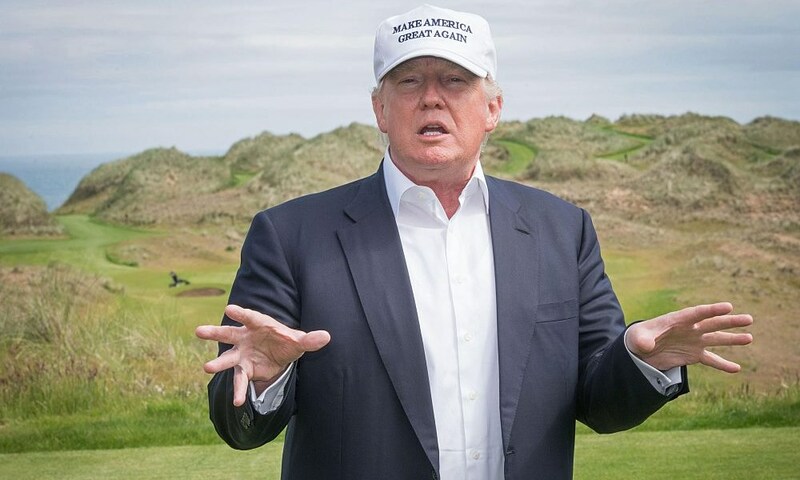 With Donald Trump announcing his candidacy, it soon becomes apparent that the mendacious orangutan-tufted thug is set to do to the political landscape, and perhaps to the global balance of power, what he so effectively and damagingly did to Scotland. With many references back to the original film, we catch up on the 92-year-old Scottish widow Molly Forbes and her elderly tractor-fixing son Michael, who have been hold-outs and nuisances, blotting Trump’s landscaped ideas. The households are without water since the first film, despite promises that a pipe Trump’s workers broke would be repaired. Molly’s stoic dignity contrasts with Trump’s bluster and nastiness effectively. Likewise, Michael’s stubborn integrity belies the sneering condemnation of Trump and Trump Jr. Their cases are backed up by a legal expert and local sympathies have started to turn against Trump as the promised jobs and investment failed to appear. The golfers are also not flooding to the course, which is beginning to look like one of many busts that lie in the Great Orange One’s wake. As Trump prepares to accept the GOP’s nomination for the presidency, Michael and his wife fly out to Cleveland to confront the mogul. However, it is here that we realize that in confronting this particular Goliath, Baxter’s film is all sling and no stone. There is no way they are going to get anywhere near the presumptive candidate and although the film begins with Baxter setting up for an interview with Trump – who had seen the first film – none of this interview is actually shown, leaving the impression that the documentarian fluffed it. In fact, what the rank injustice, the intimidation and bullying calls for, demands even, is the door-stepping balls of a Michael Moore or even the passive aggression of a Louis Theroux. And not just of Trump and his immediate family, but also of the Scottish politicians, legal authorities, journalists, councillors and business leaders who have allowed this to happen. Some good points are made about Trump’s silence concerning the poisoned water in Ferguson and there are some parallels with another widow bullied by Trump to make way for limousine parking on a beachfront casino. This is a timely and necessary reminder of Trump’s practices, but like Michael Moore’s Michael Moore in Trumpland, this seems like another missed opportunity, a wry exasperated sigh, when we desperately need some full on rage.